CARTOONIST Reggie Lee conveyed a message to me via a colleague recently. 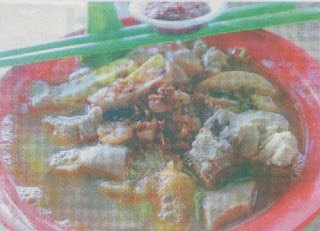 He said the best prawn mee can be found in Subang Jaya's ss14/2. It is located at a coffe shop called "Unlimited". What a strange sounding place! in the township famous for wantan noodles. That aside, I set out on a quest to try out Lee's recommendation. And it wasn't hard to locate the eating outlet because of its proximity to the New Pantai Expressway. On a late Saturday morning, I decided to head there with my wife Michelle. By the time we got there, the coffee shop was packed with customers and lucky for us, we found a table in front of the prawn noodle stall. Without any hesitation, I ordered a bowl from an Indonesian woman Who was helping out at the place. "Ah boss, want to add pai kuat? cheong? far yuk? ", she asked. I asked her to dump everything into the bowl of noodles. Michelle ordered a bowl of pan mee while I patiently waited for the prawn noodles to arrive. I was wondering if the noodles would measure up to what I usually eat at New Apollos coffee shop in USJ 4? Service was prompt and I was charged RM6.50 for the bowl of noodles and just as I was about to sink my teeth ito the noodles, a guy came up to me. He gave me this strange look and said:"You are from The Star right? I read your column a lot!". For a brief moment, I was dumbfounded. When I came out of it, I extended my hand for ahandshake. Michelle was laughing and saying, "Wah, I never knew you got fans eating here lah." After the brief interruption, it was back to eating and I found that the prawn mee at "Unlimited" coffee shop is of a decent standard. There is a generous portion of noodles and ingredients. For RM6.50, I would say that what I would expect from Lee's recommendation was fulfilled. I was told that on weekdays, the stall closes by 11.30am. And since this stall is open during lunch hour, the best thing to do is to head there early. There is ample parking space here if you drive. For you gearheads out there, the la-long coordinates for this makan place are 03 04368 N, 101 35 371 E, So, good luck and happy hunting!